We were surprised to hear that Zerve is shutting down. Tour operators had to make a decision quick and we thought we’d outline a few things to consider when finding a replacement. We also added a special offer to Zerve customers to waive their monthly fee entirely. You can read more on that below. Most reservation systems have the ability to create a tour inventory, set the times of the tour, limit the party size, block holidays, sell the ticket online, and deliver the money to your account. You pretty much need these features to manage real time inventory. Some of the other features that vary from system to system tend to focus on cost structure, marketing, ease of use, and integrations. I’ll outline things to consider about each of those below before listing 5 reasons to use Reservation Genie as your alternative to Zerve. We have seen some reservation systems offer free bookings from your website and higher fees if the customer books directly from their website. This business model has dominated (and plagued) the restaurant industry. Reservation Genie has been determined to minimize the damage that can result from this strategy as part of our pricing structure. The problem is that if the reservation system earns more profits from customers that book from their website than they do if they book from your website, it creates an incentive to intercept your customers. There are many ways to do this. I’ll outline a couple below. Google Ads: The tour reservation system can post google ads that are triggered when a customer searches for your tour by name and many customers will click that instead of visiting your website. We saw Groupon do this to some of our Austin tours and it cost them dearly. Not only did the Groupon give 50% off the tour to customers that were likely to pay full price, Groupon also kept a big percentage of the discounted fees. It cannibalized ticket sales drastically during the Groupon period. Reservation Genie does not charge anything when customers use deal sites to book our tours and so it also hurt our revenue. Search Engine Optimization: Another longer term strategy to intercept customers includes search engine optimization. Because reservation systems naturally get links to them, they tend to rank well in search results. The more customers they get, the better their rankings. Eventually your profile on the reservation system competes with your own website in Google searches. If customers click the wrong link, you pay more in fees. There are countless advertising options, usability optimization strategies, and strategic partnerships that can lead to customers booking the more expensive path over time. Reservation Genie charges a flat $3 PER RESERVATION convenience fee for all bookings, regardless of source, so there’s no incentive to have customers book on our site instead of yours. And if they do, it doesn’t cost you more. Many systems simply serve your website customers and have no outside marketing value they bring to the table. For some tour operators, this is all they want and the tools are more about efficiency. Some systems offer additional marketing by including you in an online tour guide. Zerve did a great job of this. Customers could go to Zerve and find things to do organized by city and activity. Reservation Genie also does this and you can see it action by clicking on the tours tab located on this tours in Austin page. We use that page to encourage customers to book a second tour in Austin by sending a special offer after they buy their first tickets to get 10% off their next tour. This marketing value is spread around all our tour clients in Austin and is included in our $49 monthly fee. We also run a second site that operates as a guide to Austin and feature our clients in an Austin Things To Do Guide for free. Reservation Genie’s niche feature is that we offer a tool set to build, manage, and grow concierge referrals. For concierge bookings we charge $2 per ticket and send $1 directly to the concierge. You can also add a fee on top that you settle with concierges directly and we will send you a monthly report to manage your referrals. Our concierges tools appeal to a lot of tour operators since concierges and tours both cater to visitors. It’s important to determine if your tour reservation system drives extra marketing value as that may justify a higher fee. Reservation Genie’s niche feature is that we offer a tool set to build, manage, and grow concierge referrals. The list of these features can go on infinitely. In my opinion, there are some core features to keep in mind. Does the reservation system build a profile for you that lists all your tour packages and create an easy way to update these online vs. updating your website? Zerve did this and it can definitely be convenient. Reservation Genie does maintain a profile for each tour operator that includes a description, gallery, and Google reviews that concierges and customers may use to research tours. However, we encourage you to include the primary source of information for your tours on your website as it increases your ability to search engine optimize individual tours by activity. Reservation Genie will even manage and host your website as part of the $49 monthly fee and help you with this search engine optimization. Another key efficiency feature revolves around mobile access to your reservation information. Because tours are so often managed in the field, it’s very helpful for you and your guides to have access to everything on your phones. Reservation Genie offers a mobile optimized platform as well as Iphone and Android apps for tour operators, customers, and concierges. Does the tour let you have different tour prices, inventory, and times for peak and off peak season? We work with two large bat watching boat tours in Austin and their tours start at sunset just before the Austin Congress Bridge Bats depart. Since sunset changes throughout the summer, we built tools that let them have different start times before and after daylight savings time. These same tools are used by most of our tour operators to manage different inventories during peak and off peak season. Without them, there’s a lot of work associated during the transition from peak to off peak season. I hear Zerve did a great job of answering the phone and dealing with tour customers. By doing so they sort of operated like a part time employee and a lot of tour operators liked this feature. I personally feel like that could cause issues if our employees were not well trained on your tours. Reservation Genie doesn’t have a call in number to buy tickets. For our clients, we usually optimize their website to answer the key questions of who, what, when, why and where in a way that minimizes calls. 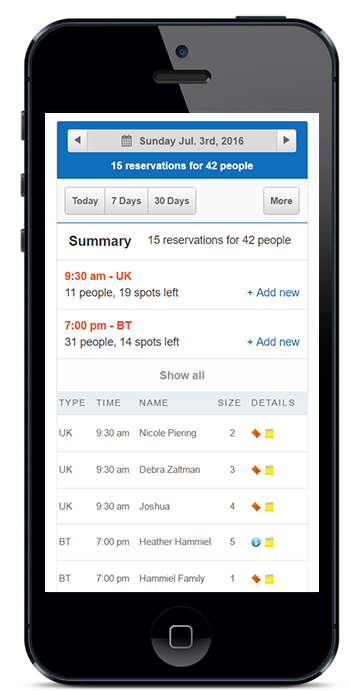 This streamlines the booking process and leads to more online bookings vs phone bookings. The more automated the process, the better the experience is for everyone involved. Many of our tour operators only take bookings online due to desire to ensure the customer receives their welcome email with things to know about their tour, a reservation reminder the day before, and other touch points that are entirely automated. Some tour reservation systems integrate with other websites in ways that drive you business. Frequently some of these integrations drive you business and some intercept your customers and lead to paying fees for traffic you would have received naturally. For example, many tours use Viator simply because Trip Advisor will create strong calls to action on your profile and that helps you stand out on Trip Advisor. We track stats for customers that visit tour websites from Trip Advisor profiles and the numbers are higher for those that do not use Viator. This suggests these tours are paying a 20% commission for customers that would have eventually visited their website and booked for free. when considering integrations, the main variable is cost. Reservation Genie offers a book now button that you can install on Facebook and various websites that will track the total bookings from those sites. The goal it to help you make advertising decisions. If a local online guide is promising to feature you for $500 per month, you can request they add the book now button that tracks results and measure if being featured generates the necessary ROI to pay $500 for that advertising. So if you made it this far, thought we’d add a special offer for Zerve customers now that you have the necessary tools to make a good decision. We will waive the $49 monthly fee entirely if you mention this blog. We’ll earn enough off our respectable and safe $3 PER RESERVATION convenience fee that is paid entirely by your customers during the booking process. Below are our top 5 reasons to use Reservation Genie as your tour reservation system. Concierge Tools: We provide unique tools to network with local concierges. So you invite them to join your referral network, track all of their bookings with reporting tools and monthly email summaries, and set up special rewards per person booked. Front Door for Customers: We’re more than just software as we maintain a full guide for concierges and regular customers that leads to extra bookings. Total Mobile Optimization: Our entire website is mobile optimized and we offer android and iPhone apps for concierges, customers, and your tour operators. Transparent Prices and Low Convenience Fees: We charge $49 per month plus a $3 PER RESERVATION convenience fee that your customer pays during the booking process. So if somebody buys 10 tickets at $30 a ticket for a $300 sale, the convenience fee is only $3. Compared to models that charge percentage convenience fees, this leads to a better deal for customers. If you use our concierges tools, we charge $2 per ticket for concierge referrals and send 50% directly to the concierge. Transparent Reporting: Tours can set up any website they control with a book now button and track results from that website resulting in better long term advertising strategies. If you’d like to learn more you may Schedule a Demo directly from this blog or call us at 512.687.3277 and we’ll do our best to answer questions. We welcome any comments or feedback below.